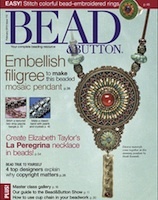 Filling in the filigree By Heidi Kummli - Work bead embroidery in, around, and on top of a large filigree component for a stunning pendant with vintage appeal. Crystal bridges By Laura Landrum - Lay the foundation for this beautiful scalloped bracelet with crossweave technique and crystal accents. A hidden bugle bead base supports the decorative stitching from below. 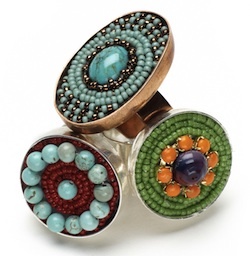 Ring tones By Beth Moser - These deep-bezel ring blanks, typically used for resin, make perfect frames for bead embroidery. 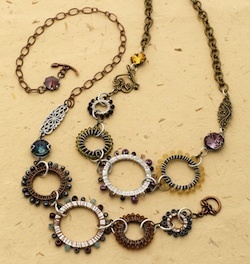 Choose one with around or oval opening, and incorporate small cabs, seed beads, or even cup chain! 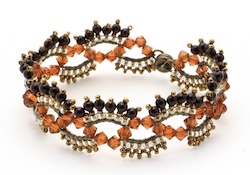 Fiesta fringes By Cary Bruner - Adorn curved links of chain with bicone crystals, pearl fringe, and a seed bead edging for this bracelet. Then make a pair of earrings to match! 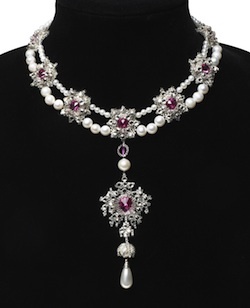 La Peregrina tribute By Maxine Henry - The original La Peregrina necklace was designed by Cartier and incorporates a large pearl drop, diamonds, rubies, and cultured pearls. 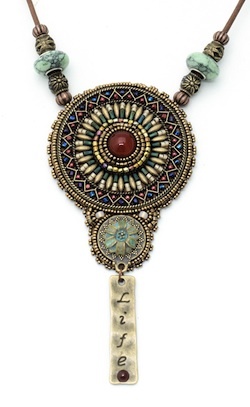 This stunning interpretation utilizes beads that are slightly more attainable and combines peyote stitch, herringbone, netting, and brick stitch. 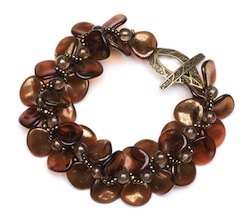 Petal power By Nichole Starman - The right-angle weave base of this flexible bracelet works up quickly and provides support for shapely rose petal beads. 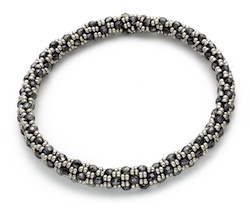 Embellish the band with seed beads and round beads for an accessory that's always in season. 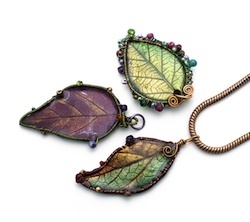 Out on a limb By Deborah Anderson - Branch out to new techniques with a leaf pendant featuring polymer clay, resin, wirework, and a handful of beads. 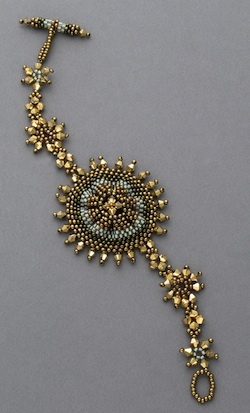 Seed bead supernova By Lucy Baker - Gather one edge of a peyote stitch band to make a ruffled medallion a the center of a star-studded bracelet. For a subtler statement, try a pair of ethereal earrings. 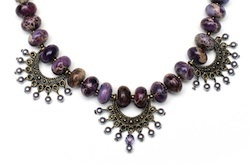 Fashion-forward findings By Julia Gerlach - Filigree findings create a gently scalloped profile for an easy strung necklace. Head pin dangles provide just a touch of movement. Pebbled-path bangle By Mandy Duffy - Incorporate fire-polished beads into a tw0-drop peyote bangle for a quaint cobblestone effect. Designing with Cup Chain By Jane Danley Cruz - From the catwalk to the craft fair, this sparkling crystal chain is playing a starring role in modern jewelry designs. 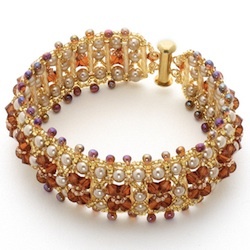 Cups of plenty By Cathy Lampole - Sparkling crystal cup chain overflows with glamour in this right-angle weave bracelet. Rings of time By Jessica Fehrmann - Use wire-wrapping techniques join seed beads, drops and crystal-encrusted ring together in this timeless necklace.